This is a guest contribution from our very own Shayne Tilley. Before you hit me up for a loan, let me preface this post. That number represents eBooks sold in for various masters and partners in the last decade. Yes there are a couple of mine in there, but it’s a tiny fraction of a % of the total. Okay, with that out of the way, a big part of my digital life has revolved around eBooks. I’ve been trying to sell eBooks before anyone really knew what they were. I’ve tried just about every approach, channel, launch strategy there is, and made pretty much every mistake in the eBook. I’ll admit, a lot of the time I was making it up as I went along. There were no rules to this eBook game. When it comes to selling eBooks, there are lots of techniques and tactics that will people motivated to buy, but there is none more powerful that a great eBook. True word of mouth will sell more copies than your marketing copy ever will. People are happy to spend a $ 100 on an eBook that solves a problem they put a high value on. Higher than the eBook price anyway. The length of your eBook should be as long at it needs to be to deliver the value you promise. I read and listen to people like Darren and my friend Kevin Yank and I know they are better at explaining things than I am. It’s the truth but it didn’t stop me writing two eBooks. It did teach me that I needed to focus on the skills I wanted to improve on. Every eBook I’ve launched that has gained great early momentum (and was evergreen) has always delivered the most over a long period of time. Don’t think about what you’ll earn from great launch now; think of the impact momentum will carry over the life of the eBook. People care about why you wrote the eBook just as much as what’s inside. When you tell a story and share emotions, people will be a lot more inclined to listen to what you have to say. If you want to play in the sub $ 10 eBook market then getting your eBook into places like iEBookstore and Amazon are a no brainer. But they’ll work against you if you want to aim higher than that. Used well, these marketplaces can reach millions of readers but if you have your own audience you might not need to bend to their will. Bad reviews can kill eBooks – legitimate or not. Sometimes there’s not much you can do about a bad review but you should know what people are saying. Don’t just look at Amazon reviews, Google ‘[your eBook] review’ and see what comes up. Chances are your potential customers already are. Whilst this is perhaps fading, printed books carry more prestige than an eEBook. You might consider printing a small batch of books so you can give them to your clients (and your mom). This is even more important if your eBook is the bait not the fish (we’ll talk about that later). If you want your eBook to live a long life then evergreen content is the way to go. If you want a big win now, a timely eBook is an option as long as you remember that the clock on the longevity of your sales is already ticking. You just stick your eBook on Amazon and let Amazon work it’s magic, right? Wrong. Don’t expect to create an eBook and just magically sell your way to retirement. You’ve got to continue to sell you and the eBook at every moment, if you want it to pay the bills. The amount of times people talk to me about their social media eBook does my head in. Honestly. There are so many eBooks on this topic already – why would someone buy yours? If you’re going to plonk your eBook into an open marketplace with a bunch of similar eBooks that already have history, sales and reviews, you might be wasting your time. But if you already have your own audience and can launch it to them, you might just get some instant momentum. People expect quality in eBooks. I don’t care how good a word nerd you think you are. Get a second opinion. Don’t expect to create the perfect eBook. It doesn’t exist and probably never will. For the perfectionists, call it done and ship! You won’t make any money with it in draft. Don’t think you need to create the next 50 Shades of Grey to make good money. Even the super niches are large enough to create a volume of buyers and well worth your while. The wider the niche the more potential customers but the more competitive it will be, so it’s a balancing act. This is a technique I use to understand who my readers are and what they want. Your sales page should be full of benefits and promises. Write those promises first, then make sure your eBook delivers on them as you create it. Two of the most successful eBook publishers I’ve worked with created their first eBook as a collection of posts – with a few extra bits wrapped up in a nice design. Remember what you’re selling, then look at what you’ve created already and you just might find an eBook in there. I’m not going to talk much more about launches, as there’s another 30 lessons in there. But if your launch plan is only one day – you really need to talk to me! Of the hundreds of eBooks I’ve launched, the only sales pages I didn’t write were for my own two eBooks. Why? Because I just couldn’t be objective. You’re likely to focus on the hard parts to write, which probably are not the part your readers care about. You’ll infer and miss stuff — it’ll get messy. Get someone else to do it, or, at a minimum get someone else to pick it to pieces for you. I’ll guarantee you this, there’s no guarantee or sure fire success when it comes to eBooks. Sometimes you can pick ‘em and other times, they’ll come out of left field. But you’ll never know if you don’t try. When you launch you eBook, there will be a bunch of people who you’re convinced will help you spread the word. You’ll learn a lot about the people who do and who don’t. I’ve spoken about this before, there is no one size fits all perfect launch day (or every single eBook would launch on the same day!). So just get it done and stop worrying about when. You can write eBooks, charge money and that’s your income. You can write eBooks, charge money and open doors. Or you can give away eBooks to sell other products and services. There’s nothing wrong with any of these plans however, you need to understand your objectives and focus on them – rather than trying to get the best of every world. Creating an eBook isn’t easy. There are lots of things to think about and anyone who tells you it is easy probably has a product to lead you to. That said, it’s hard work done once and can be extremely valuable. At a minimum, it’s something to be really proud of. There is a time-limit on every eBook. Well, maybe not all eBooks – but most. Don’t expect that in a decade, you’ll still be selling the same eBook in the thousands. If you want to keep the revenue flowing, think about new editions and new titles. My stick is my partner Justine, and Problogger’s stick is Jasmine, our eBook creator (she’s a wonderful person!). If you procrastinate, you need help. Find it in any way you can, or you’ll never ship. Think about what your title means to a reader, now and tomorrow. Think about how they will remember your title and how they will describe it to others. Coming up with a great eBook title is a bit of an art form like email subject lines and headlines but you don’t have as much chance of running A/B tests to get it right! This is really a tip about your mindset. When you’re writing, you’re delivering a message to your reader and you need to focus on doing the best possible job. Immerse yourself and be narrow-minded. If enough people try something, eventually someone will get it right but that doesn’t mean it will work for you. Someone else’s success is probably during a different time, on a different topic with different readers – and you’re a different writer. Your perfect launch story is your own. Of all the things that scare you about putting an eBook out on show, the reward (even if it’s just a personal one) will be worth it. I’m a two-time author who got D’s in English. If I can do it then you can! 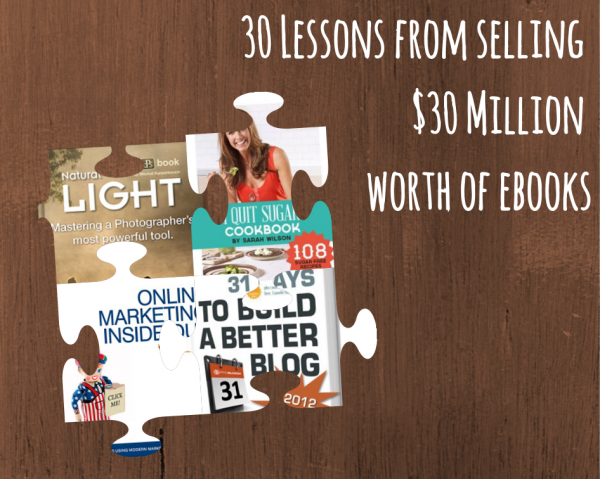 So there you have it, 30 things I learned selling a crap load of eBooks. I’m sure there are more so I’d love to hear about some in the comments!